Tweak the user interaction features of OS X. Is there a better alternative to SlideMode? Is SlideMode really the best app in System category? Will SlideMode work good on macOS 10.13.4? 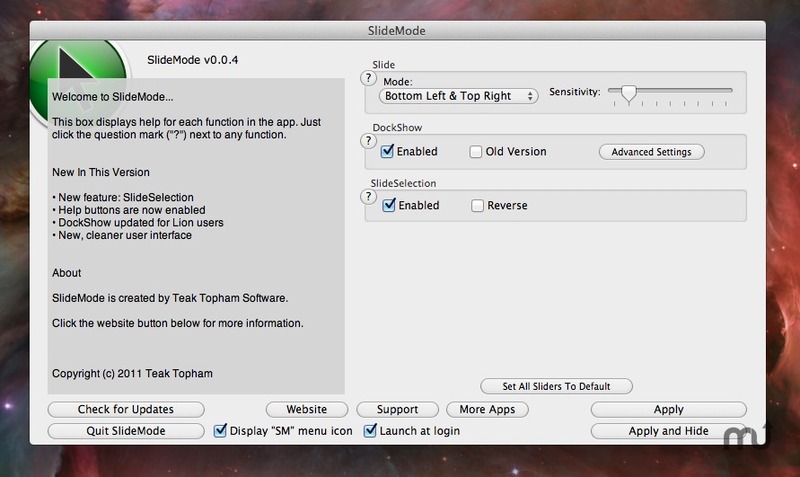 SlideMode is an app for tweaking user interaction features of OS X. Use Slide for switching OS X Desktops with your mouse, SlideSelection for moving your text cursor with a trackpad, and DockShow for Hiding and Showing your Dock faster than the standard Autohide. "Slide" for quickly and easily sliding between your OS X desktops. "SlideSelection" for easily moving the text cursor with your trackpad. "DockShow" for autohiding the Dock much faster then the OS X standard autohide.